Next week, a reunited Concrete Blonde will embark on a sixteen-city tour to celebrate the 20th anniversary of their classic album, Bloodletting. A remastered version of Bloodletting, complete with six bonus tracks, will be released next month. We got a chance to ask singer Johnette Napolitano about the tour, collaborations with other artists, and the future of Concrete Blonde. Culture Brats: How will The Vampires Rise concerts work? After Bloodletting, how much time will you be able to devote to the rest of your catalog during your show? Johnette Napolitano: I'm glad you asked that because I never, ever said I would play Bloodletting from beginning to end, ever. The Anniversary is a great reason to get together and tour, but we'll do what we always do and we'll end up just doing what we want, but we will lean a lot on Bloodletting, I think we always did balance our sets well. Culture Brats: What is your favorite track from Bloodletting? Johnette Napolitano: Oh, I don't know. I really like "The Vampire Song" because it's just such a 'character' of a song. I feel like a Pirate singing and drinking and strolling in the French Quarter when I sing it. Culture Brats: In addition to Concrete Blonde, you've had the opportunity to work with some great artists like Dream Syndicate's Steve Wynn, Wall of Voodoo's Andy Prieboy and Marc Moreland, and The Talking Heads' Tina Weymouth, Chris Frantz, and Jerry Harrison over the years. Johnette Napolitano: I certainly have, haven't I? Culture Brats: Are there any collaborations that almost happened that you wish did? Who would be your dream collaborator? Johnette Napolitano: Tom Jones. I don't know how that didn't happen but it was apparently going to at some point. I have an amazing song for Tom Jones. I just collaborated with Jesus Montoya, who is probably the best Flamenco singer in the US, and certainly one of the best in the world, and an amazing crazy gypsy. I'm working with a Flamenco group called Ven Pa Ca in New Orleans. People are always throwing out names to me. I've been wanting to do something with Justin Sullivan of New Model Army for a long time, and I'm working with David J [Bauhaus, Love and Rockets] on a project called Tres Vampires with an LA DJ named Shok. You can hear a track from that on MySpace. 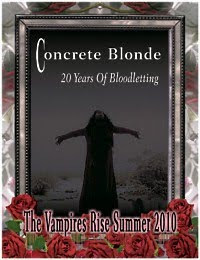 Culture Brats: When The Vampires Rise tour comes to a close, what are the plans for Concrete Blonde? Are there plans for another tour or a new album? Johnette Napolitano: We know the reason this is fun right now and working is because there's no pressure. We had no plans to tour at all and I'm in the middle of a solo album, but put it off until the fall to finish up because this will only happen once, you know, a 20 year mark. Hell, I don't even go to my High School reunions! We don't know and figure we don't really need to think about it much, the future. Culture Brats: What are you currently listening to? Are there any new bands that you really enjoy? Johnette Napolitano: My friends Flametal, who are opening for us in SF and LA, are amazing. They fuse Flamenco and Metal, which makes all the sense in the world to me. I hear a lot of new stuff I like - I don't know why people complain so much about the state of music, there's always something going on I like. I have to admit I don't keep up on everything, there's just too much and I'd never get anything done at all. I always listen to tons of Massive Attack. I love Henry Rollins' radio show on KCRW, he's on Saturday nights for a couple hours. I hear a lot of stuff on the radio but for one reason or another will never find out who it is. Culture Brats: Thank you so much for your time!